If you look through a Laos travel guide you’ll find the Kuang Si waterfalls coming up as “the top-rated”, “must-see”, “unmissable attraction in Luang Prabang”. Also, if you browse over some reviews on TripAdvisor, not one person seems disappointed by them. Simply put, these falls aren’t “just another waterfall”. Over the years a single large 60m cascade tumbling continuously from the jungle, carved several multi-tier pools of bright turquoise water, making the site look pretty much like the garden of Eden. The sunlight piercing through the green tropical vegetation, the wooden bridges, and even the little fishies nibbling at your feet once you get in the water feels like paradise—it’s like a Spa at the Olympus! They can be visited all year round. There’s only a downside of doing it during the rainy season: the water will be cloudy and muddy instead of blue. Tuk-tuk: you’ll find many tuk-tuks around town ready to get you there. By gathering a group of 3 to 4 people you can split the bill. Rides are about €22.50 for a round trip and for half a day. Mini Bus: any travel agent on Sisavangvong Road have mini buses or minivans going to the Kuang Si Falls every day. The price are €3 per person with pick up at your hotel. Have in mind that the departure and return times are set from 11:30 AM to 2:30 PM (which is a big downside). Motorbike: can be rented for €11, use maps.me for guidance (Google Maps doesn’t work that well in Luang Prabang). Bicycle: rentals start at €1 a day and most hotels in Luang Prabang provide this service. As backpackers, our mind is always set to save as much money as we can, so we chose the bicycle—it’s only 30 km anyways, it’ll be fun, we thought. We can make a cycling excursion out of it! So there we went: two tall guys pedaling on bikes not made for adult men and with no gears (but were the only ones available in our hotel that day). On motorized vehicles, rides take 45 minutes. Opening hours: every day from 8:00 AM to 17:30 PM. Next to the main entrance are restaurants, fruit stalls, bathrooms and small wooden huts to change clothes. As you might expect, the park is very popular among locals and tourists. 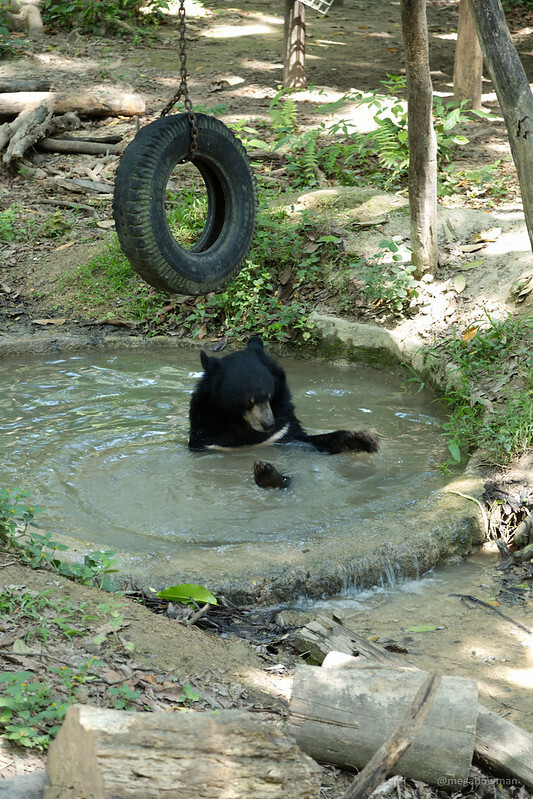 At the beginning of the park is an animal sanctuary housing 25 Asiatic Black Bears rescued from the hands of poachers and traffickers. Lamentably to this day, bears keep being illegally sold to Vietnam and China for their bile—a valuable component in traditional medicine. On the right side of the larger waterfall is a muddy and unkempt trail running through the middle of the forest all the way to the top of the fall. Up there everything is quieter and the dense vegetation covers the light, but the view is spectacular! The end of the day came without us noticing. When we got on the bicycles and saw that the sun was almost gone, it hit us: HOLY. F*CK. We still have a 4-hour bike ride to Luang Prabang! In less than an hour we were pedaling on pitch black—no streetlights whatsoever and completely alone. At one point to actually see the road, we turned the phone’s flashlights on, but the light attracted an assortment of flying bugs (beetles, grasshoppers, moths, and mosquitoes) that kept flying into our face, eyes, and mouth. Nuno’s bike chain kept coming off forcing us to stop every 10 minutes to fix it, and every time we stopped we heard rustling coming from the bushes at the side of the road. As far as I’m concerned it could be a rat, but it could also be a fled bear from the park or a chupacabra thirsty for blood, and we were freaking out! After god knows how many hours we arrived in Luang Prabang starving, exhausted and with a newfound love for tuk-tuks. Are you planning on visiting the Kuang Si Falls? Will you do it by bicycle? Have you been there already? Let us know in the comments below. Cover photo by Shankar S.
Ohhhh my! Such a beautiful waterfalls! Where is this again? Laos right? And I wann see real bears such as those on your picture!! huhuh this will be a dream come true! That water looks incredible! Traveling through nature in the darkness with no light, I can see why you chose that GIF! ? Yeah, it’s an accurate representation of what we were feeling at that time. ? It wasn’t easy but it sure was worth it!